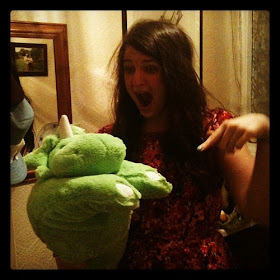 t*rexes and tiaras: One week, one pattern. 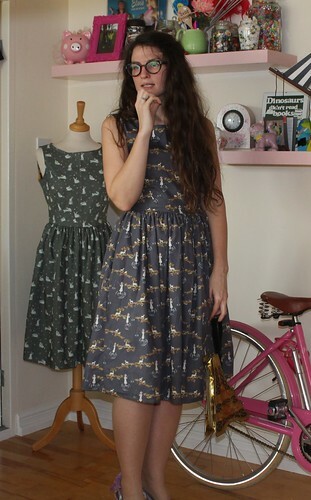 So far this year, I've upped the number of dresses in my handmade wardrobe by 45, at last count. These have been a number of different patterns, but when I saw that Handmade Jane was running a "One week, One pattern" challenge, I thought it was high time I went back to my first love: Simplicity 2444. 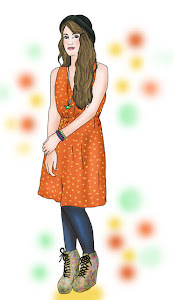 The premise of the challenge is easy - you wear items from the same pattern for one week. I made some new dresses in the weeks leading up to the challenge which I saved in readiness, but some of the dresses I wore were ones I'd already made and have worn a lot. 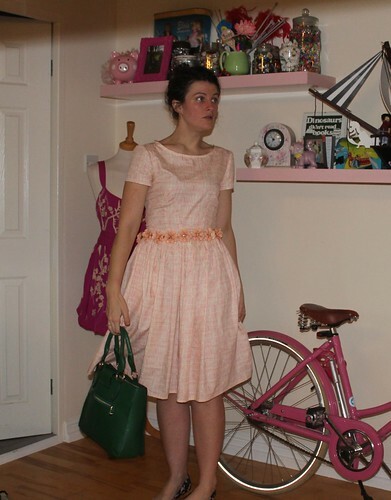 For Day 2 of the challenge I went back to my 2444 roots with the first dress I ever made from this pattern! This poodle print fabric was something I found in my local haberdasher when I first started dressmaking. 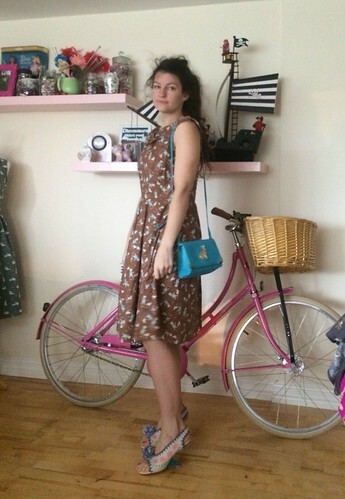 I worked on this dress for months with the help of my ever-patient sewing tutor, as I'd decided to improve my dressmaking skills as part of my Queen's Guide award. I haven't worn this dress a lot lately but I should. Days 3 and 4 were new and recent makes. I'd planned to save these for the challenge when I made them and it was nice to have "new" dresses to style. I really like both of these - the monochrome print of Day 3's dress means that it will go with just about any colour, as will the pale print of the houses in Day 4, so I'd imagine that I'll wear these often. Day 5's dress was the third fabric I bought from Sew Hot when I bought the pig fabric. I made these three fabrics up in succession, hindered only by waiting for a zip delivery, and then put them all aside to wear for #OWOP and I was pleased with how much I liked them all when I came to wear them. 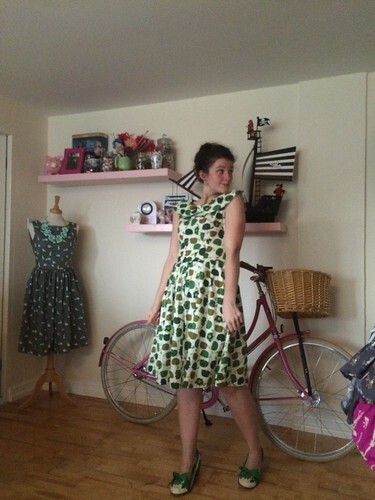 For Day 6, I dug out a dress I made back in January from some tortoise print fabric. I've worn this before but not for a while. And finally, the ostrich one, which I've worn a couple of times now, since making it a couple of weeks ago, finished off my week. Until I decided to do this challenge, it had been a while since I'd last made any 2444 dresses. I have to admit that coming back to it reminded me how much I love this pattern. The flexibility with things like the collar, a waist tie, which I used to always make but haven't for a while now, and the different sleeve lengths is one of the reasons I keep going back to that pattern, I think. Did you take part in #OWOP? Super thanks to Handmade Jane for making it happen! Aww, I love visiting Alex and Oscar! awwwww these are such fun dresses! I love the ostrich print it's super cute!! Thank you - I think the ostrich print is one of my absolute favourites! It's SUCH a great pattern, you can just do so much with it! Thank you, I'm making the most of my sewing enthusiasm and trying to work my way through my fabric. I've had a little time off this pattern in recent months, favouring the Emery, or the Betty, but I'm glad to have rediscovered my love for it! 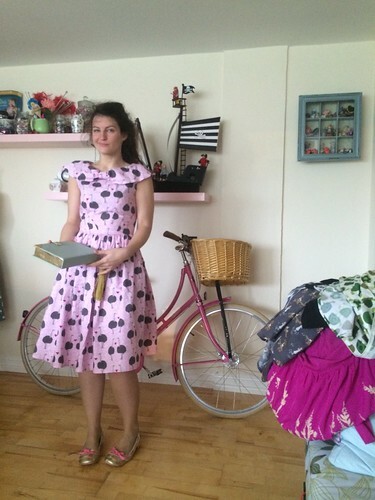 I agree with Louise, that's an amazing number of dresses to make! I love all the fabrics that you've used, but my very favourite is the ostrich one. 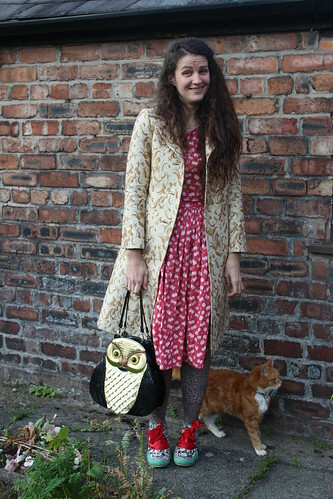 Oh thank you - I was pleased to finally make the ostriches into a dress as they've been waiting patiently for so long! Aww, thank you! I really need to make the effort to use my Pashley more often! I absolutely LOVE your day 6 and 7 dresses. The collar style looks gorgeous on you and needless to say the prints are awesome. Thanks so much. I do love this collar, although I try not to make too many dresses with it as it seems a little bit too fancy. Hello found your blog at last! as i usually see you on instagram! 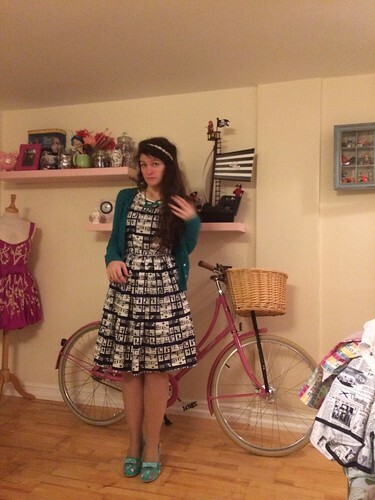 Your owop week was fab, i am loving your style, my fave is Day 4 and I adore your pink bike too! Thank you. I can't decide which is my favourite, I really like them all. I must start using my bike more! !